Discover how top organizations like Clemson University, Genesis Healthcare and Pontoon Solutions are finding and engaging with top talent. Studies show that some three-quarters of the workforce are open to learning more about new roles, but may not be actively looking. Every great recruit needs a warm-up before they’re ready to play. Talent leaders are embracing the latest digital marketing techniques to foster enhanced brand awareness and candidate relationships. 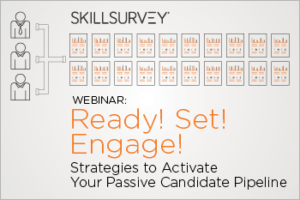 Watch this webinar to gain some useful tips and best practices on engaging with passive candidates.